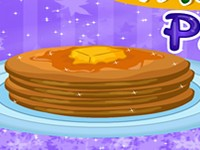 It is an interesting free cooking game that enables young girls like you to learn cooking faster. Shruti’s house is going to be crowded as some guests are going to visit her house. She looks into her fridge and gives her mother some food items to prepare a delicious sweet banana pancake for guests. You have to help her mother to make a pancake. You should choose the required ingredients to make the sweet dish. You have to be fast as the guests are going to arrive very soon. This exciting girl cooking game is designed and presented to you by games2teens.